I really didn't think it was possible. Hailing from France, Holy Cross neither sings in French nor extreme metal which, as in most countries, is the latest thing. Then again, except for those 'in country,' I'll bet the average international metalhead could not name more than a handful of French metal bands, significant or not. Invoking the oft forgotten inspiring ghosts of heavy metal past and dismissing current trends, Holy Cross delivers straight up, full speed classic melodic heavy metal. 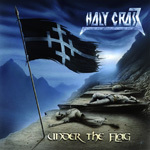 Holy Cross' style on Under the Flag draws deep from the NWOBHM, but has a sometimes rougher more thrash-like edge. You hear it most in the vocals, but also in their sturdy heavy riffs. But Holy Cross also borrows from power metal making many songs like The Fortress of Asgard and King of Hill gallop along at a quick pace. Overtones of Iron Maiden are likewise heard as Holy Cross deals some fret lightning with twin guitar solos through many songs. Not forgetting tradition, Under the Flag ripe with lyrical tales of sword, sorcery, and fantasy. Pure Steel Records has found another heavy metal gem in France's Holy Cross. Heavy riffs, an ambitious pace, and fiery twin guitars make Under The Flag a true metal headbanger's delight. Very recommended!